Scroll down for a list of Richmond hotels that accommodate five (5) or six (6) in one family room. The price/rate range of each hotel is indicated by the “$” sign. See the $-symbol key in the sidebar. Click on the hotel name for more details. This list includes larger hotel rooms and suites for budgets from affordable to luxury. All guestrooms have private bathrooms unless otherwise mentioned. 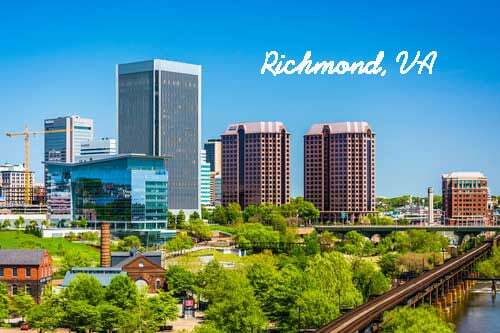 Richmond, Virginia holds an interesting place in the historical landscape of the United States. First of all, it was the location where Patrick Henry gave his famous 1775 pre-Revolutionary War call to arms speech, “Give me Liberty or Give me Death.” And, it was the seat of the Confederacy during the American Civil War (aka War of Northern Aggression). Commercially, with its strategic location along the James River, it was the national hub for both the tobacco industry and the slave trade. To the outsider, it feels like a city coming to terms with its varied past. The “heroes” of the Civil War line Monument Avenue, along a contemporary statue to Richmond native and tennis great, Arthur Ashe. Finally, there are excellent museums that portray thoughtful perspectives on the Civil War and the US history of slavery.